Coupon publisher News America Marketing (NAM) is making NFC at-shelf promotions available to the majority of its 52,000 member retail network in the US, in partnership with NFC specialist Thinaire. The new SmartSource with NFC program involves adding NFC tags to NAM’s SmartSource Shelftalk and Shelftalk Banner products, enabling shoppers with an NFC device to tap to receive branded media content without the need to download an app. QR codes are also provided for those without NFC phones. 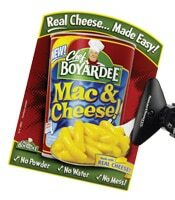 The roll out follows a pilot test of NFC and QR codes which took place at five Safeway grocery stores in California’s San Francisco Bay Area in mid-2012. The pilot found that NFC phone users’ engagement with Kraft shelf-edge advertisements was twelve times higher than the engagement level of those who used mobile barcodes. Nokia to offer NFC and Bluetooth Treasure Tags?